History & Philosophy of the Painted Appaloosa & Appaloosa Sport Horse Stud. We originally chose the appaloosa breed for its bold colour known as the leopard coat pattern; however the first horse we bought unseen almost 30 years ago was a “white” purebred appaloosa with minimal spots which had sought after foundation appaloosa linage. The latter a rare find in a country that only had 3 to 4 imported appaloosa lines at that stage. We soon realised that the genetic component of a breeding individual was far more important and interesting than the actual phenotype since this will determine your success of your stud for future generations to come. This focus point enabled us to look past all visible traits and breed some of the most impressive individuals whom offer the whole compendium and not just the bold colouring. The average generation interval of a horse is about 10 years which means that the average breeder will have about 4 to 5 generation intervals to explore and if the selection intensity of the breeding individual is not of the highest priority the breeder will waist valuable time in the rate of genetic progress. At the Painted Appaloosa Stud we carefully selected a set of traits that we prefer in our horses and then chose certain strong genetic based lines that for fill these requirements. We also do not use fixed breeding combinations and we also do not use one stallion on multiple mares as we feel this would not guarantee the best possible outcome. This is why we only breed a few selected foals, 2 to 3, per year that we provide with the best environment to grow its genetic potential to its fullest. We breed purebred appaloosas to conserve the gene pool for future generations, but at the same time sustain a high level of genetic diversity to avoid unnecessary inbreeding accompanied by inbreeding depression. Objective for our purebreds: An elegant individual that can stand its ground in any show ring in-hand or ridden. Painted Hi Valentine Sparrow, a good example of our elegant purebreds. 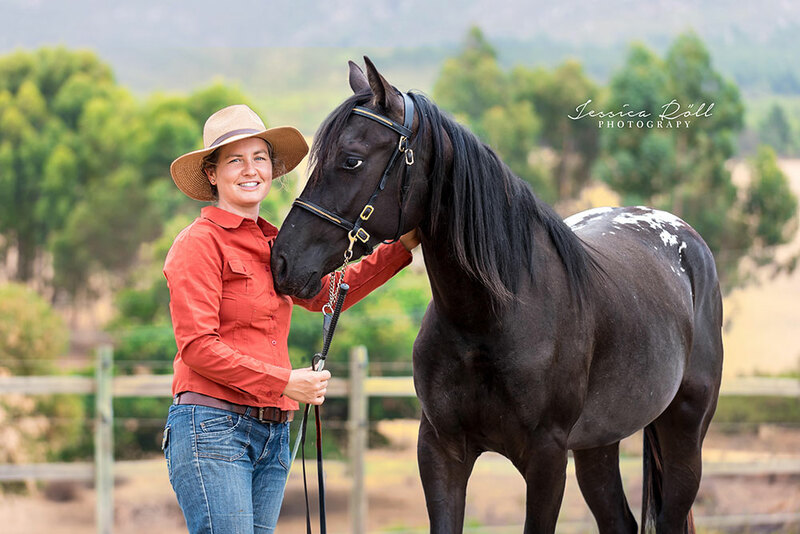 Already as a 2 year old she placed in the top two for the 2018 Western Cape potential dressage championships for young horses. Photo by Jessica Röll photography. 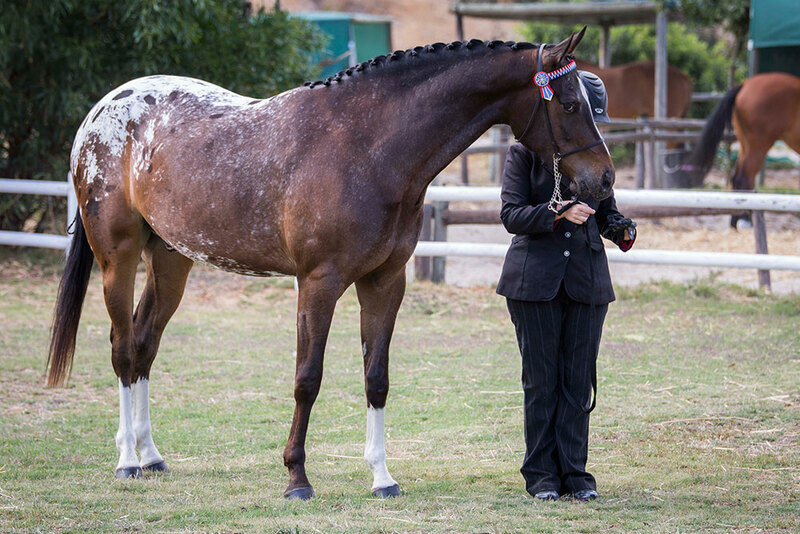 Painted Hi Quadroon, another SP purebred 17hand appaloosa, whom has taken the Western Cape show world by storm as a 3 year old. Keep your eye on this champion owned by Charmaine Fourie. Our Appaloosa Sport Horses are for a specific rider market to be enjoyed and climb the grades in the most known equine sporting disciplines: Show jumping, Dressage, Eventing and Showing. We do not believe in crossing individuals for the purpose of obtaining a crossbred, but to synthetically engineer a unique individual. Pure breeding is challenging, but breeding to establish a composite breed is even more so. Fine planning, knowledge and a large amount of capital are spent to guarantee the best outcome. However after several years of breeding these individuals we have had a 99% success rate with all our foals competing at high level praised for their willingness to please, exceptional talent and good looks. Our objective for our synthetics: Use the best ambassador for the breed from each breed to for fill the specific requirements. Painted Cape Whisper, a good example of one of our sport horses and this was the very first one we bred! This photo is of him jumping 1.25m with Nadia Sadler at the 6 Bar event 2018. He was also the South African Appaloosa Sport Horse of the year since 2014 up to date and ranked number 1 in South Africa and in the Western Cape for the Adult 1 m show jumping. 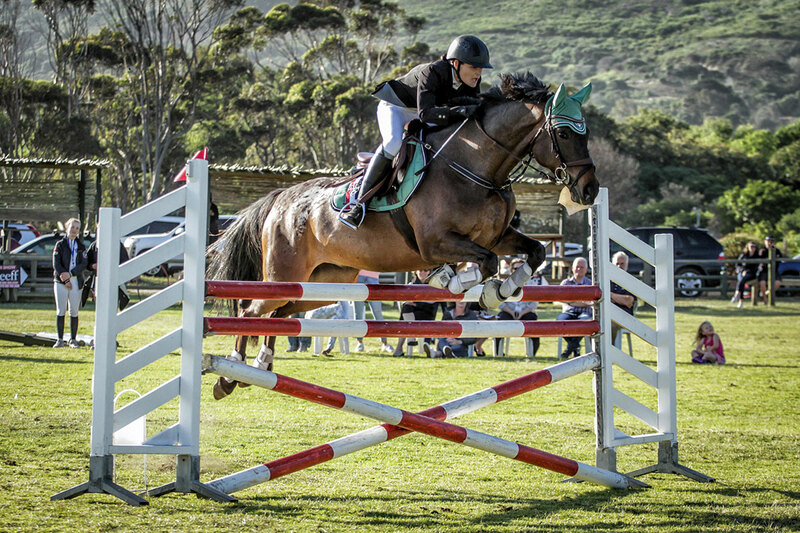 He further won the Adult show jumper and Victor Ludorum winners for the NRA (Noordhoek Riding Club) Annual Club Awards for 2017. He finished the year with enough points to be graded and compete in 1.10m. Our horses are all unique in appearance and personality to find the best fit for our wide variety of human personalities, but with the same quality across the whole herd that guarantees train and ride ability. Each and every individual that we keep to grow is correct and sound mentally to guarantee the highest level of success in our management system. Our horses are known for their strong structural frames, good hooves and sound minds. We have large terrain that consists out of mountain and river areas and although we manage our horses intensively with two balanced meals right through the year, ad lib grazing and roughage with 4 weekly rasps and worm counts. We prefer them to grow up in a herd structure to learn naturally about pressure and release that eases them into the first training steps when of age. We do not imprint our foals and only start working them when they are confident enough to except human intervention. This way they are sensitive to applied pressure and excessive pressure will never be necessary and a willing positive relationship between horse and human is established without blurring the lines. We prefer to sell our horses after backing since we like to guarantee that the initial steps of training are in place. We also prefer to work with the “new owner” and the horse he or she chooses to best fit their personality and needs, this way we can establish a safe and sound future for our horses. Most of our youngsters will attend shows before the age of two to introduce them slowly but surely to the outside environment and accompanying new stressors. This way our clients also know they are well handled used to all the showing preparations and can load, travel, clip, tie and stable. Obviously horses need to be correct with natural talent to attend all breed shows and we always place in the top two with our first time youngsters judges by National and International judges which shows you the quality since our competition in the Western Cape at shows are Warmblood based. A lifetime of equine practical experience formally qualified with an MSc in quantitative genetics and PhD in reproduction physiology with a holistic hands-on approach.